The Company formed Berkley Healthcare. On April 17, 2017 the Company marked its 50th anniversary, having ended 2016 with $7.7 billion in total revenue, more than $23 billion in total assets and $5 billion in stockholders' equity. In 2016, the Company announced its entry into the high net worth personal lines market with Berkley One. It also formed Berkley Insurance Asia, Berkley Transactional, Berkley Cyber Risk Solutions and Intrepid Direct. In 2015, the Company announced that William R. Berkley would become executive chairman on October 31, 2015 and W. Robert Berkley, Jr. would assume the role of chief executive officer, continuing the transition plan implemented by the Board of Directors when Rob Berkley was named president and chief operating officer in 2009. In recent years, the Company has continued to expand at an impressive pace, primarily through the creation of new businesses. In 2008, Berkley Asset Protection Underwriters, FinSecure, Berkley Canada, Berkley Professional Liability and Berkley Offshore Underwriting Managers were all formed. In 2007, W. R. Berkley Corporation was named Best Managed Insurance Company by Forbes Magazine and set a new record during our 40th Anniversary year by earning $744 million. Total assets surpassed $16.8 billion, total revenues exceeded $5.5 billion and net worth reached $3.7 billion. In April 2004, W. R. Berkley Corporation joined the ranks of the Fortune 500 with $3.6 billion in revenue and $1.7 billion in stockholders’ equity at year-end 2003. The Company reached a major milestone in 2001 when it moved the listing of W. R. Berkley Corporation common stock to the New York Stock Exchange (NYSE). At the turn of the century, the Company refined its strategy. The regional companies were consolidated to reduce costs, enhance size and scale, and to provide better competitive positions, while maintaining operations close to the customer. This segment was also repositioned to emphasize commercial lines of business and targeted niches, while withdrawing from personal lines. Revenues passed the $1 billion mark in 1995 as the Company continued to expand. Presque Isle, Berkley Surety Group, and Berkley Insurance Company of the Carolinas were all established, as was Vela Insurance Services, which writes contractor and liability coverage on an excess and surplus lines basis. The year 1994 marked additional milestones for W. R. Berkley Corporation. To bolster the services segment capabilities and add critical care capabilities, Key Risk Management Services was acquired. In the early 1990s, the Company continued to grow through both acquisition and the formation of new companies. By 1987, the Company’s total assets surpassed the $1 billion mark, total revenues exceeded the half-billion dollar level, and net worth rose above the one-quarter billion-dollar mark. Through the early 1980s, the Company continued to grow its regional, specialty and reinsurance businesses, and added an insurance service provider to its portfolio of companies. From the mid to late 1970s, the Company marked three important milestones. In 1975, W. R. Berkley Corporation instituted a policy of paying a regular cash dividend. In the early 1970s, the Company entered various aspects of the insurance business and debuted as a public company. 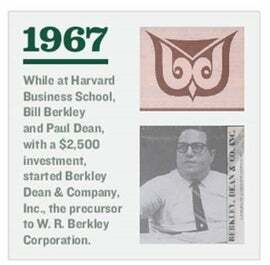 While attending Harvard Business School, Bill Berkley and his partner formed Berkley Dean & Company – an investment management company that was the precursor to W. R. Berkley Corporation – with a $2,500 investment.